The 92 does not terminate in the same place as the 332, which is precisely why it has a different destination name. Indeed Brent Park Tesco (the 332 terminus) used to be a curtailment point on the 92. I agree "St Raphael's North" is a bit of a bodge although I can't really think of a good name for the place. EDIT: Ah I see vjaska beat me to it. Brent Park, IKEA would probably be the best name for it given the last stop is precisely that. "Hornsey" on the 144. The route runs right through Hornsey, so where in Hornsey is the terminus? Well it turns out that the last stop is at the junction between Turnpike Lane and Wightman Road, so the bus doesn't actually serve Hornsey proper. "Chelsea" on the 211. No idea where in Chelsea this one was. I think it's now been replaced by something more specific. I was thinking about something IKEA-related, although the Brent Park Tesco stop is right next to the rear entrance to the IKEA car park, so might be a bit misleading. I'm struggling to remember what the 232s used to show when they were curtailed there in the evenings (because of antisocial behaviour at St Raph's). It certainly wasn't "St Raphael's North" - I have a feeling that was a First / Centrewest invention for the 92, in the days when operators could make up their own displays. The 211 displays ‘Chelsea, Redcliffe Gardens’ it’s done so for a while now. Even before the NRM days. 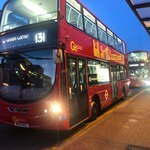 The 172 has now returned to Clerkenwell Green via a diversion via Grays Inn Road and Clerkenwell Road, this has been the case for quite a while now. Wait, really? The first and last stops on the API show Snow Hill only. In fact, Clerkenwell Road (Stop H) doesn't even include the 172 on the API either meaning ETAs for the route will never appear. Would love shorts / curtailments from angel road superstores to Islington angel! Yes you’re right, Ive taken the 92 from the first stop before and I knew the two 92/332 termini were very near, couldn’t remember so looked at one of the apps and misread the map thinking stop T (which is the 332’s last stop) was also the 92’s last, when it was actually it’s second to last, with C being the last. However the two termini are very similar but the destinations seen on the blinds would suggest their absolutely nothing alike. ‘St. Raphael’s North’ could literally mean anything and is completely pointless. No reason why Brent Park IKEA could be used. Ridiculous choice of wording if you ask me. The 366 with Redbridge - I'd personally think that Redbridge, Falmouth Gardens (with a upper case qualifiers) displays would be more meaningful for the route. It really irritates me how the 11, 42, 133 and 344 all advertise their destinations as Liverpool Street. Obviously, Liverpool Street bus station is closed so the 11 and 133 have to set down on Old Broad Street. On the other hand, the 42 and 344 set down in on Appold Street, almost in Shoreditch. I think the 42 and 344 should advertise their destination as Liverpool Street, Appold Street.